This pic was taken in the Dolomite Mountains, during a trekking to the Veneggia Valley, at 2000 mt of altitude. This is a really strong and emotive photo. Simply breathtaking and well and truly worthy of the blue prize! A GREAT B/W shot. Congrats!! Message edited by author 2008-02-10 15:48:21. Terrific leading lines and comp and dof - what more is there to say? Definitely worthy of the blue! Holy Cow! Freaking awesome work. Adding to favs for sure. A well deserved blue. I love the lines leading to the mountain, and the detail on both the snow and mountain. Awesome shot! I really love the contrasts within this. Well done and congrats on the blue!!! This is awesome! Perfect lighting, compo, dof, contrast - everything! I can't believe everyone didn't give this a 10. Congratulations! Beautiful shot, great use of leading lines and vertical comp. Gorgeous shot! Congrats on the blue, and it is certainly deserved. The contrast, the composition, everything. Well done! Wow Paolo, a Blue in the Free Study! You ARE the man! Excellent composition, with the S-curve leading the eye to the center and the climber there... The B&W conversion works very well as well... Congratulations! I knew it. You made it to the top. Congratulations with your summit success and an exceptionally good picture. Outstanding shot and truly majestic scenery. Congrats on the blue ribbon. Truly stunning effort! So much emotion in a beautifully composed image. I am truly gobsmacked that 3 people voted this a '4' - what were they thinking?!? Well done Paolo, awesome B&W, awesome location, photograph even feels cold on my screen here in Australia! Awesome shot--so glad to see it ribbon. Congrats! Congratulations on your blue ribbon! I wonder what the altitude was here? I like the wide range of lights and darks, and how the path draws the eye to the figure. The dramatic shape and form of the foreground and the contrast of light make this a truly magnificent shot. Mind you, I'm impressed by the midground and background as well. wow - fantastic work here on the exposure/post for such a high contrast scene. great composition too. That looks seriously nice! Hope you reached you objective. I like how the tracks lead you to the climber... nice b/w conversion as well. For me the hot spot on the right pulls the eye away from the main subject of this otherwise beautiful capture. ...with pleasure! 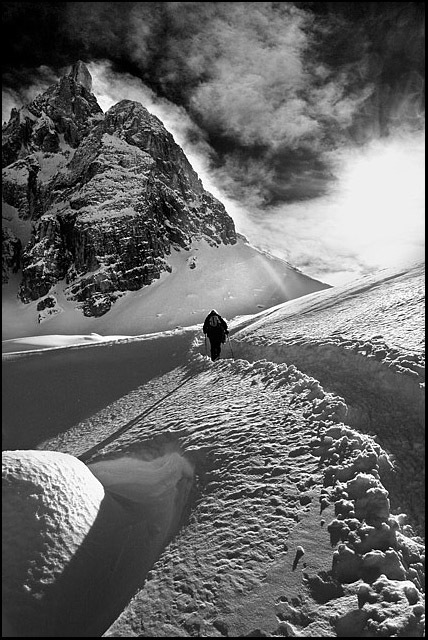 great alpine black and white, looks like the snow might be a little wind blasted, but sastrugi makes a good contrasty subject! Proudly hosted by Sargasso Networks. Current Server Time: 04/23/2019 04:49:27 PM EDT.